For most parents the Christmas season really starts when their little ones come bounding through the front door, full of excitement and bellowing "I need a shepherd's costume! I'm shepherd number three!" Yes, the Christmas Nativity is the highlight of the school year and there's no feeling like that which you get when watching your child singing along to Away in a Manger amidst a gaggle of giggling Angels and tittering Wisemen. The Nativity teaches the children the true meaning of Christmas while giving them the chance to put on a performance to wow their parents, and it is by no means a new phenomenon. It is widely believed that the very first Nativity performance was created by St Francis of Assisi. He is said to have put on the first play in Italy, back in 1223. At the time many people were illiterate and it is thought St Francis created the Nativity play in an attempt to show everyone what Jesus' birth must have been like. He set up a Nativity scene, made a manger and collected some hay. Then he invited people from his town to perform in the play. And so it was that the Nativity was created and it has been an annual occurrence in schools ever since. Of course the happiness you feel at watching your little ones bursting with excitement for the big performance is met with the panic that comes from having to make a shepherd costume, a Wiseman costume and a dress for Mary within a week! But worry not, there are plenty of helpful tips around to make sure you get to enjoy the day with minimal stress. For an easy and effective shepherds costume take a brown sack (if you can't find one of these then simply use a brown sheet, sew up each side to create a sack-like shape.) Cut a hole in the top of the sack for your little shepherd's head and tie a piece of the rope around the middle to act as a belt. For the headdress place the tea towel over the head and secure with the remaining rope. 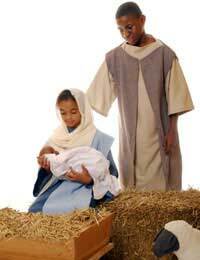 You can also follow these steps to make the tunics for the Wisemen and for Joseph. Once you have the white dress the rest is a doddle. Simply wrap some of the blue fabric around your little girl (like an olden day pashmina!) and save a small rectangular piece for the head-dress, which you can secure with the elastic. Joseph's costume is the most simple. Simply use the brown fabric to make a tunic shape (in the same way as you made Mary's dress above) and tie the rope around the waist for a belt. The three Wisemen were Kings so their costumes should look luxurious. To achieve this use extravagant colours like purples and reds. With one of the coloured fabrics make the tunic shape (see Mary's costume). With the second you can make a cloak. Simply take a rectangular piece of the fabric, a little longer than your child's height. Fold the edge of one of the shorter ends over by around 3 inches and sew. You can then thread the rope through this and secure the cloak on your little wise man. Find out more about the tradition of the Nativity here. I'm just about to make the Nativity costumes, about 6 or 7 of them for the infant school my daughter works in. These costumes will be packed away every year and brought outagain the following year. I was wondering if you have any idea as to how to make dress length alterations quick and easy to fit different height of children evry year? Thank you for your time.